1 Brief —-> 2 advertising agencies —-> Epic boardroom showdown. At least that’s what the good folks at AMC are hoping you’ll tune in for. All the big name ad agencies turned this show down, including surprisingly non-camera shy New York agency Deutsch, but hey…what else is there to watch on the TV box these days? No really, Not. Safe. For. Work! Saatchi & Saatchi Showcase is now accepting entries from young directors who have dreamed of doing better, or being better, or simply want to try their hands at advertising. The deadline for entries is April 18 (so get creating…). Finalists will be judged by a Worldwide Panel and will have an opportunity to get their ads in front of some of the highest ranking advertising professionals in the world, at the advertising awards for giants: Cannes Lions Advertising Festival. Want to see more videos and watch past winning entries? Go to the Showcase Youtube Page. Want to learn about eligibility? Download the pdf here. 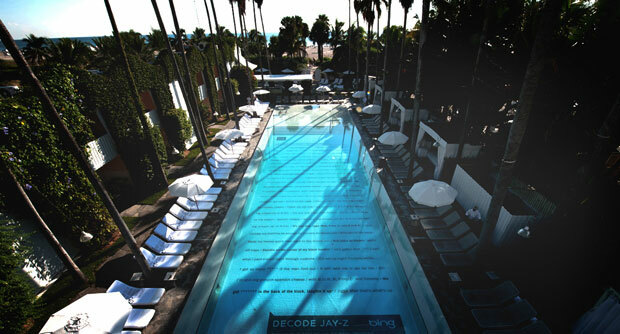 If you’re JayZ (focus now), and you wanted to launch your much anticipated book, Decoded, what would you do? Well, first you hire awesome agency Droga5, then you partner with Bing, then you expect to revolutionize the publishing marketing industry. 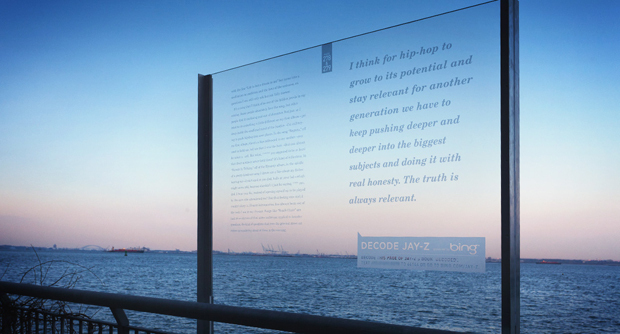 Droga5 in one of the most innovative OOH campaigns in recent times (for a book no less!) decided to place lyrics/passages from each page in Decoded in locations around the world. Not random locations, but in context of what was being written about on that specific page. Tie such a promotion with clues leaked on Bing with the usual social media suspects tagging along, and it’s no surprise that Droga5 took home a Cannes prize for its campaign. 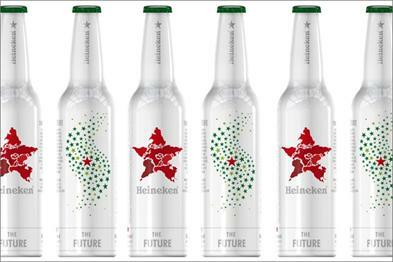 Mexican design student Rodolfo and freelance designer Lee, from Australia, connected 9,000+ miles on Facebook to create the winning design for Heineken’s 140th anniversary Future Limited Edition Bottle. 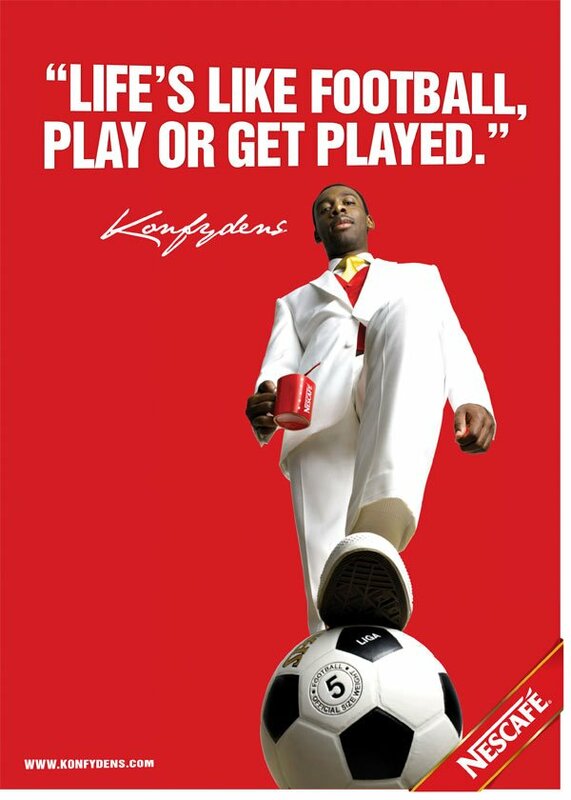 Konfydens is the new pitchman for Nestle’s Nescafe in Nigeria. The recently launched “Konfydens” campaign apparently aims to encourage it’s target market to be adventurous and accompanies a brand activation of selecting lucky consumers to take a hot air balloon trip, as well as TVC ads. 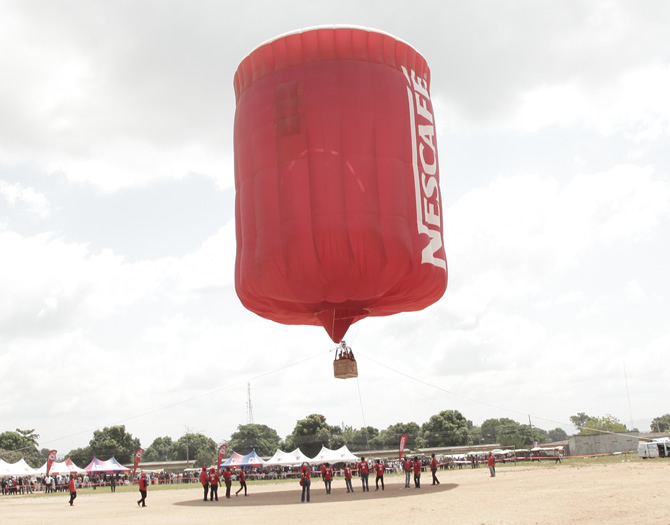 Certainly an exciting concept with the hot air balloon (in Ibadan no less! ), and certainly a new experience but one is left wondering what the connection with coffee is. #shrug. 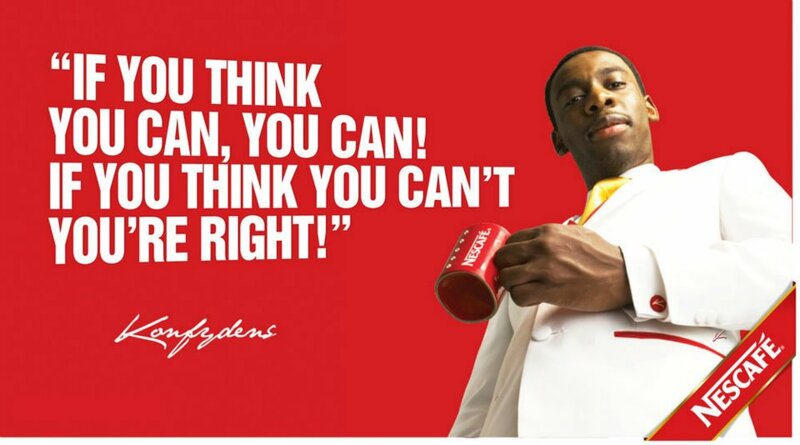 No matter, this Konfydens campaigns is a wee bit similar to the infamous Old Spice campaign – overly confident pitch man interacting directly with consumers within an ad – but it works brilliantly. 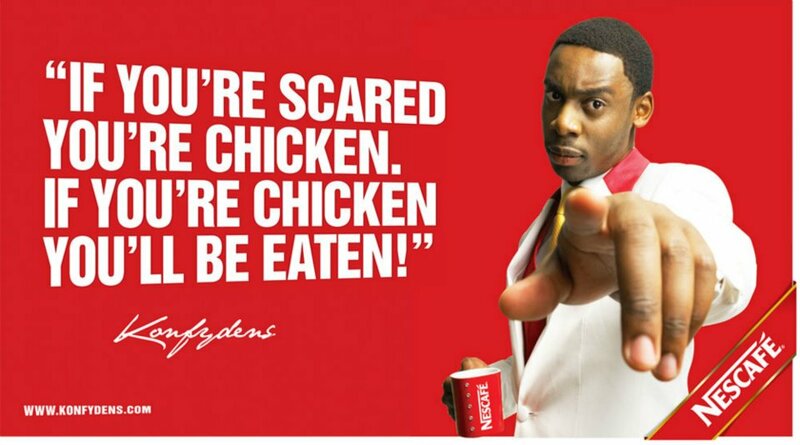 A great example of adapting successful ad campaigns from other markets into the Nigerian market. The spots above would make great billboards and hopefully Nestle will also take that route as a part of this campaign. What Do Nigerian Consumers Want? Well, for starters, you may want to try the BRENTT Consulting Nigerian Consumer Trends report. Moving along —> Finally, it seems, the world has its capitalist eyes set on Africa and by default, Nigeria. Many an article in recent times have pondered the growth of luxury brands in emerging economies, others have noticed that larger than life brands are rushing to ‘frontier markets’ in a last ditch effort to save the bottom line. It’s anyone’s guess the long lasting impact of the influx of FDI into Africa, especially once the global economy picks up in Western markets. Who will remain when the dust settles? Hmmm, time to start betting on this…. Meanwhile, Nigeria should be quite ready to soak up all the attention. KFC, Mango, Woolworth’s, Zara, Walmart are just some of the brands poised to change the consumer experience going forward. Reuters is noticing. Last week it ran an article (which reeked of a bit of confusion or surprise wouldn’t you agree?) showcasing the purchasing power and allure of Nigeria’s wealthy as Porsche launched it’s latest model 911 in Lagos. It seemed to scream to other global brands…”come over here, they’ve got a bit of money left!” On the same hand, the Financial Times takes a stab at Nigeria’s squeezed middle class and how purchasing behavior is changing especially for long held power brands such as PZ Cussons and Guinness Nigeria. It’s headline warns of imminent brand switching behavior for this much coveted income group. So what’s the takeaway?…Well, wealthy Nigerians seem to be ready for the woo-ing but the average Nigerian wants quality for cheaper. He who has hears…. Millward Brown makes move on Nigeria, due to open full-fledged offices by end of 2012. 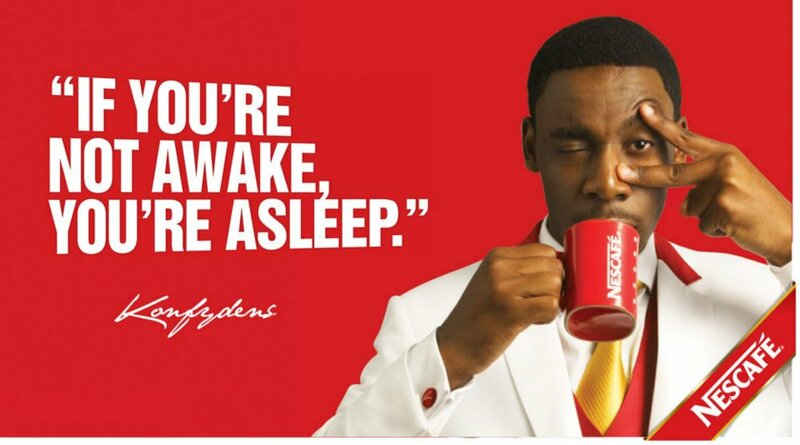 PZ Cussons issues profit warning as a result of sales lag in Nigeria, 90% of it’s African market and 30% of global market. Automatic data capturing for Out-Of-Home advertising now available locally. 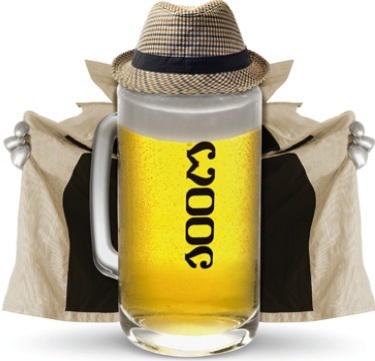 Starcoms Media emerges winner of Coca-Cola media planning & buying account. Spain’s most successful brand, Zara, bets on global expansion. Chinese telecoms giant ZTE to upgrade MTN Nigeria’s GSM/UMTS networks in developed regions. Credit-scoring technology comes to Africa. Just Marketing tackles to giant brands, Nokia & Apple, and their reversal of fortunes in opposite directions. Can Hypo Bleach rise up to all the hype? KPMG releases report on consumer shopping and online behavior comparisons between Nigeria and South Africa. Shoprite readies itself for war as Walmart enters the African market. Carat MP of Troyka Holdings celebrates MTN account win. Less gloom but no boom! The Economist on the recovering global economy. Hard to believe that this is the first pan-african campaign for Bailey’s, considering it’s relative popularity around these parts. The campaign is developed specifically for the Nigerian, Ghanian, Cameroonian, & Kenyan markets and is meant to run for a couple of years. So get REAL familiar. …pay M.I. to do THIS, and we’re there!